Hello my lovelies on this beautiful sunny day. It’s been a super nice day in my little corner of the northeast of England. It’s unfortunate that I spent it indoors. I’m going to make up for that tomorrow. So it’s been a pretty busy day in happy longarm quilter land. I spent all day working on Isobel’s lovely quilt. It’s a big one and it turned out absolutely gorgeous. 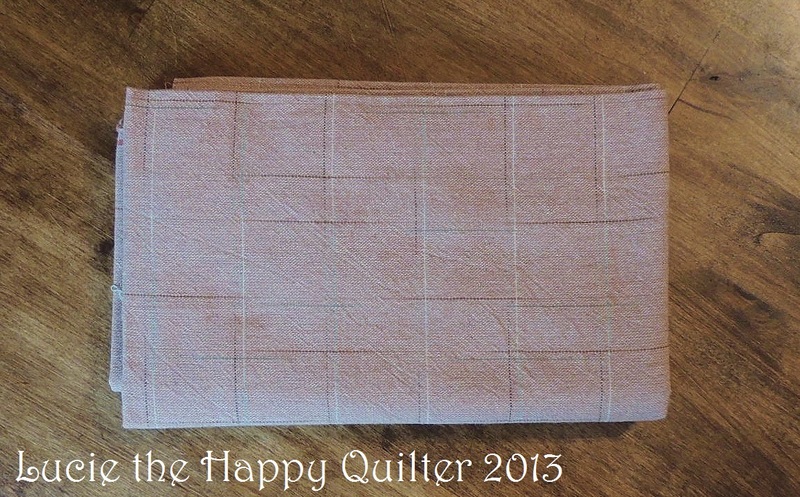 Isobel chose a quilting design called Plush by Hermione Agee and a lovely fine white thread. Here’s what Isobel’s quilt looks like now …..
You know how much I enjoy appliqué work. And when I report about what appliqué project I’m working on it’s generally something I have designed myself. Well now I have one that I didn’t design that I know I’m going to love working on. 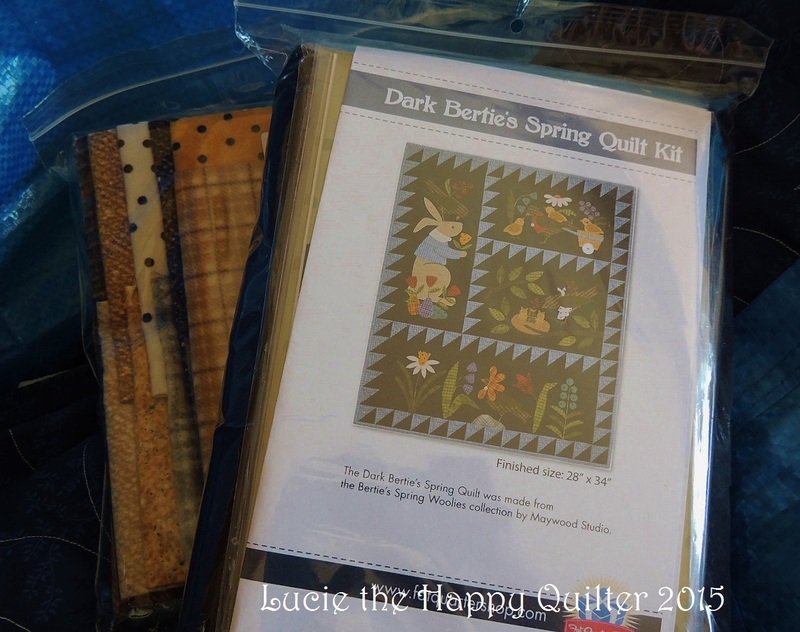 I’m really looking forward to start working on Bertie’s Spring Quilt. My preferred appliqué method is freezer paper but this one will be done as a raw edge appliqué and blanket stitch to secure the patches in place. It will be something totally different to what I usually work on. I’m stepping off the hamster wheel and doing something unusual that I know I will enjoy. Now today is the five anniversary of my very first blog post! Can you imagine???? I can’t believe that I have been rambling on for five years. Goodness I went back and read my very first post and decided that I have come on in leaps and bounds as far as posting news. Sooooo as a celebration of five years I have a little giveaway planned. 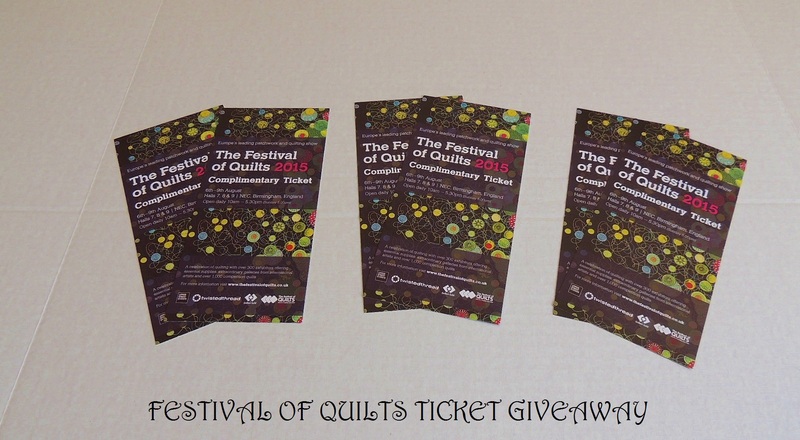 I have been given 3 pairs of tickets for The Festival of Quilts in Birmingham which will be held August 6-9th. So if you’re planning on attending the Festival enter the giveaway and you might win some tickets. All you have to do if leave a simple comment including what county and country you live in. I will post the Festival tickets within the UK. 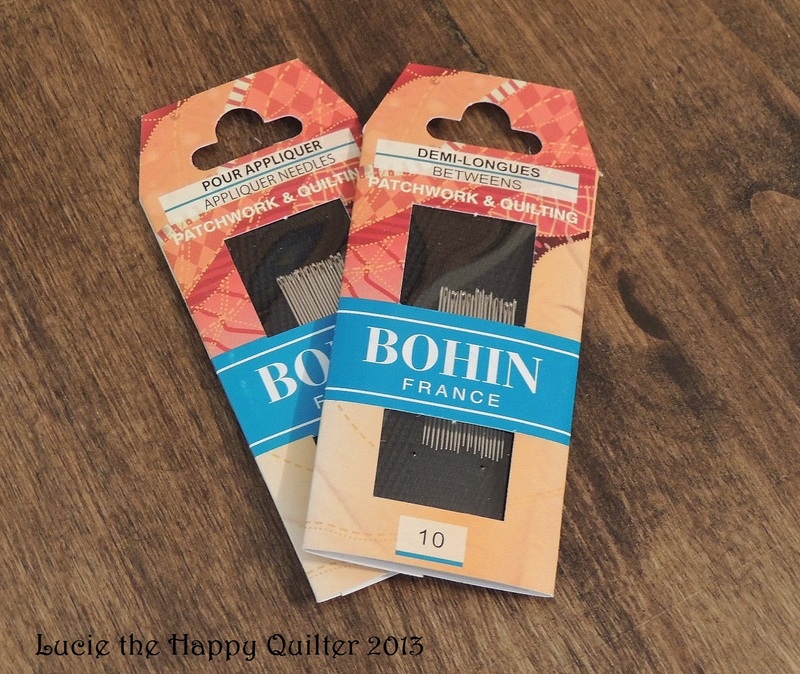 Now in order to make it fair for those who live in other parts of the world I will be adding another surprise prize, something from my sewing room which I will post anywhere in the world. Once again all you need to do is leave me a simple comment including what county, state or province and country you live in. I will be pulling the winning entries on Wednesday July 1st. Good luck everyone. Over the last five years I have learned so much about the internet. When I first started posting I didn’t dare try anything complicated but nowadays I’ll try to post all kinds of different things. Sheer determination gets things done. I must admit I’m not a great writer but I do try to get my experiences across. So thank you for sticking with me over the years. Well here we are again. Another week wrapped up. It’s been a pretty busy one for me. Monday is a bank holiday here in the UK so I’m hoping to unwind over the long weekend and perhaps be able to walk at the same pace as everyone else this coming week. This morning was spent running errands in different areas. I feel compelled to get Sarah ready for school like we used to do when she was little! However now that she will be starting college at the beginning of September, the days of buying a new pencil case and filling it with dozens of pens and pencils and so on is no more. We used to buy a whole new school uniform and new shoes and a warm coat and so on. I always enjoyed that aspect of getting her ready for school. So sort of in keeping with the back to school routine, the last stop today was M&S to buy her a winter coat before the popular sizes disappear. My Sarah will be waiting for a bus and walking a fair distance to the college, so a warm coat is in order. And of course while we were in the shop I decided to have a look at the boots. Well wouldn’t you know it, I found some I liked, so this very happy longarm quilter came home with a new pair of boots. I love shoes and boots but I always dread shopping for them. Well today I hit the jackpot. I think I will still look at the pencil cases and such just to relive the old days…….. My little girl is a big girl now. We had to visit the vet this morning to collect our monthly flea preventive treatment for our dogs. On our journey back to the car I spotted these wonderful rosehips…..
My Sarah thought I was a bit of a nutter for stopping to take this photo with my phone. I’m always rambling on about taking time to smell the flowers……. 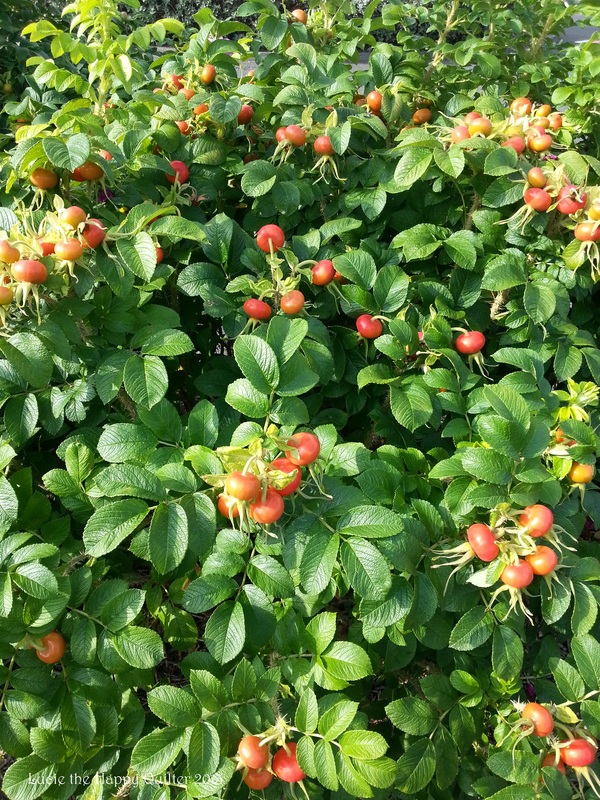 Well today I stopped to look at these wonderful rosehips. I seem to be lurching from one task to another lately. So it was rather nice to stop and to take notice of something really quite lovely. You may remember that hubby and I travelled down to Birmingham two weeks ago for The Festival of Quilts. 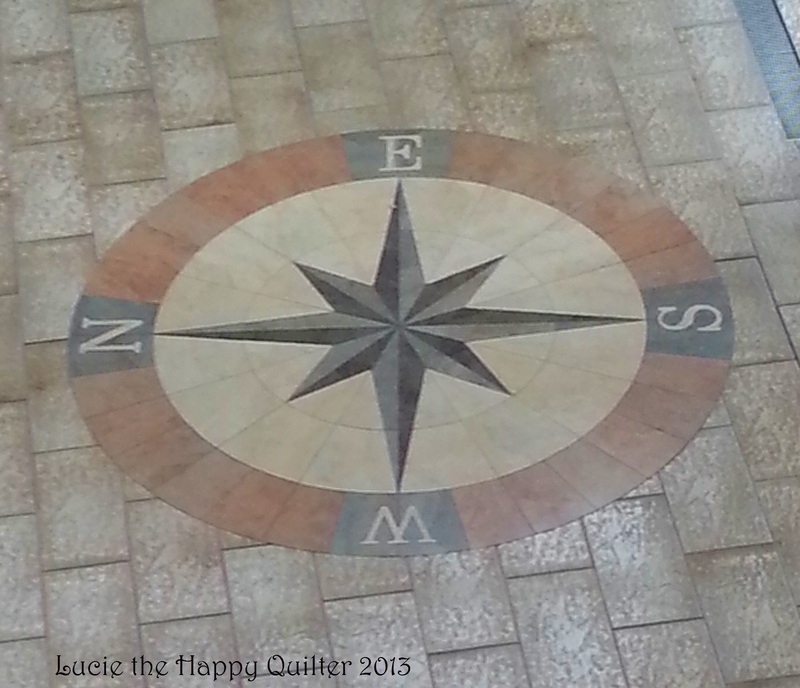 I took a photo of this super mariner’s compass which was part of the floor in the lobby of the hotel we stayed in overnight. I’ve always found the mariner’s compass interesting. I’m sure I have a pattern for a mariner’s compass of sorts in one of my books. I will add making one of these blocks to my list. I pulled out the sketch pad again today. During our class yesterday I found a bit of inspiration in the conversations we had. So I settled into recording my ideas on paper. I feel another Whimsical Applique & Stitchery quilt coming on. Designing new blocks for quilts doesn’t cost a fortune. In fact we’ve all got paper, pencils and erasers around the house. And I dare say we’ve all got a reasonable stash of fabrics we can use to make samples. So it looks like I’m off on another adventure. I’ll keep you posted. It’s been an interesting week. I have spent plenty of time with like-minded people. It’s nice to get out and about. Tomorrow I’m out again to visit the lovely Rita. I feel the need to increase my stash of solid fabrics. It’s the one type of fabric that I do not have much of. I saw loads of quilts pieced with solid fabrics at The Festival of Quilts. 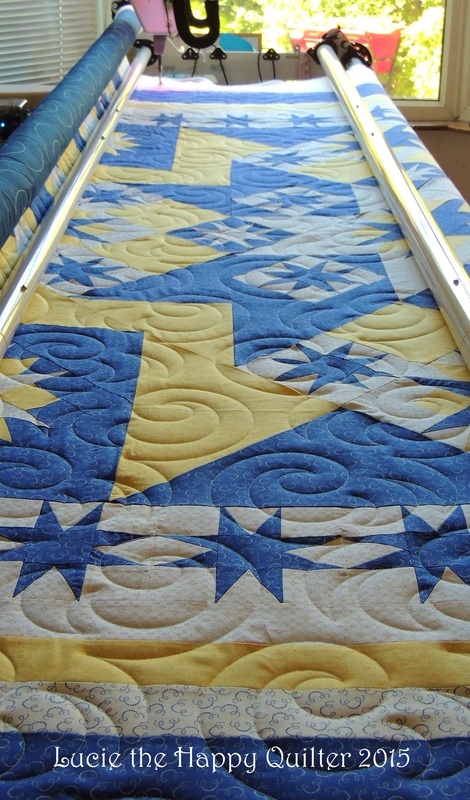 The best part of these simple quilts was the machine quilting. 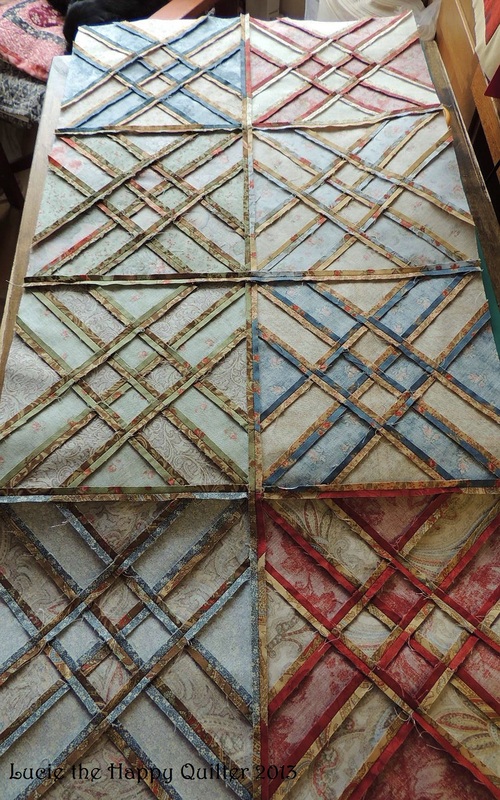 I recently took a class on Craftsy with Angela Walters and the quilts she used to do her demos were made of solid fabrics. The last time I visited Rita, she had loads of gorgeous solids on her shelves. So hopefully I’ll have some gorgeous solids to show you tomorrow. And then I can use my new Freemotion Quilting skills again. 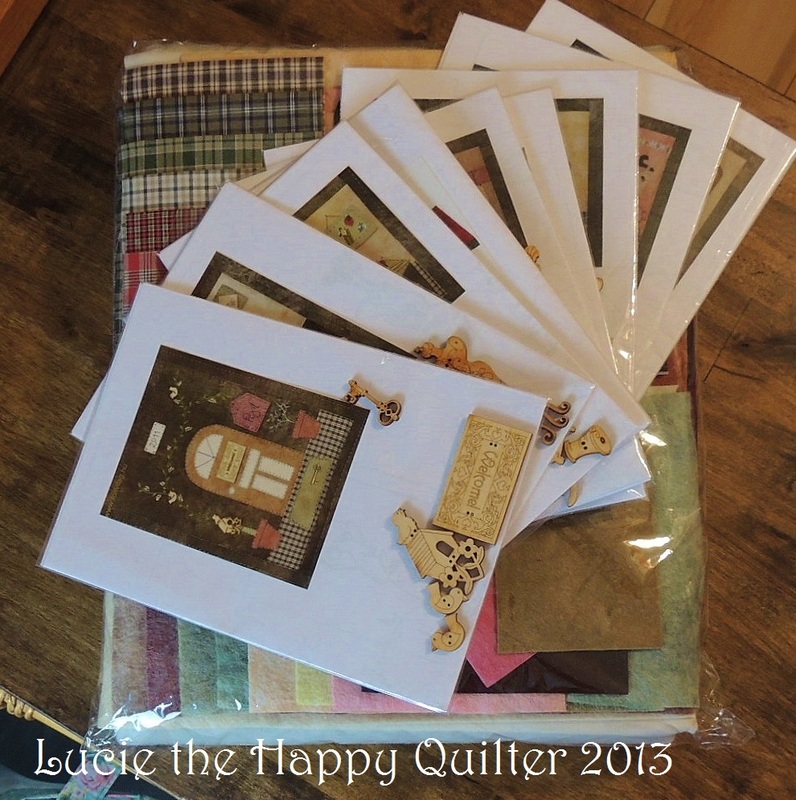 THE FESTIVAL OF QUILTS TAKE 3 …….. 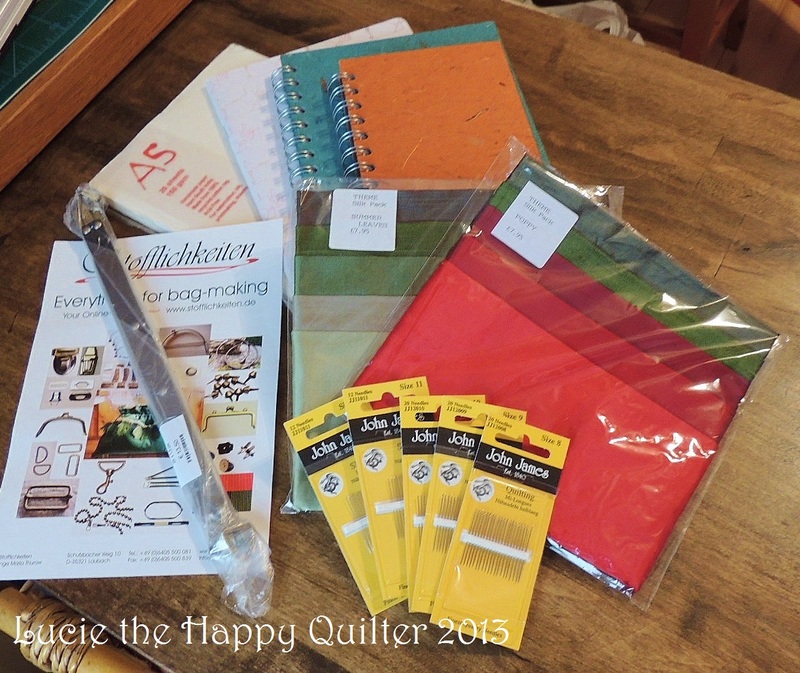 Yes folks this is the last part of my report about my purchases from The Festival of Quilts. I did go around viewing all the quilts displayed. And there were some really impressive examples from all over the world but I did not take any photos. I find it very difficult to take photos when masses of people are milling about willy-nilly. So you will have to depend on the magazines to see the best in show and so on. All in all I was rather impressed at the way the whole show was run. I’m sure there will be some who will have complaints though. I’m quite tolerant and I can appreciate how much work goes into such shows. As most of you know, hubby and I did the show over two days. We queued up on Friday morning, which was our second day, with thousands of other ladies and a few men, waiting for the doors to open. When my hubby handed our tickets to the ticket taker, who was a man, he said to hubby, you’re a brave man…… Hubby just laughed and carried on. Without the help of my family, I probably wouldn’t have been able to go to the festival this year. I’m grateful for the opportunity. So here are the last few bits that I purchased. I purchased some Japanese woven fabric from a stand called Pinwheel. I plan on using this fabric as a background to applique the lovely woollens I purchased from Magee of Donegal. 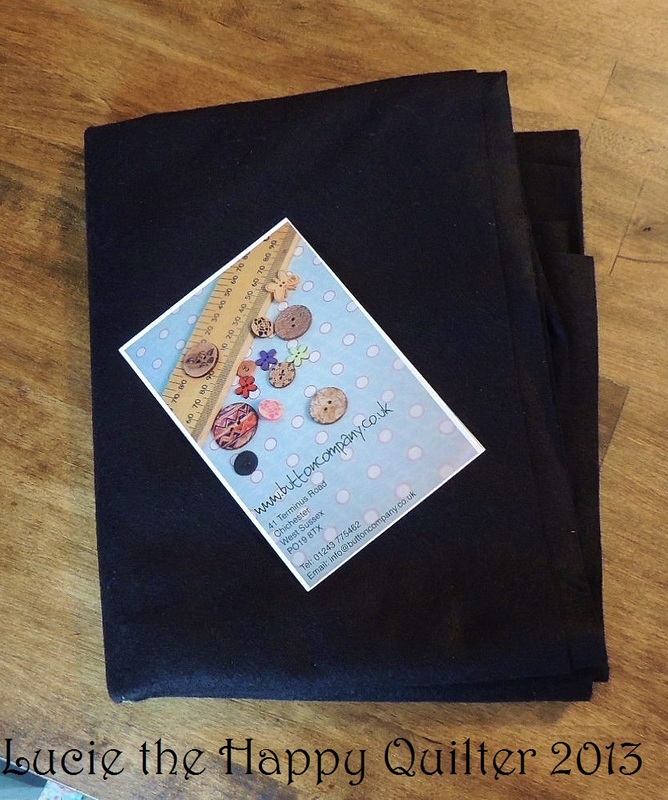 Staying on the woollen track, I got this metre of black wool felt to make candle mats from the Button Company. And here’s a miscellaneous lot of bits and pieces; some silk from Silk Route, some notebooks from Art Van Go and an internal flex frame for bag making from Stofflichkeiten and of course a few more hand sewing needles. And now we come to something pretty interesting. I bought these two kits from Foltvilag. One kit is a bag with cottages on it. And the other is the Sewing House which looks like a dolls house. This little quilt appeared in the Burda Magazine. 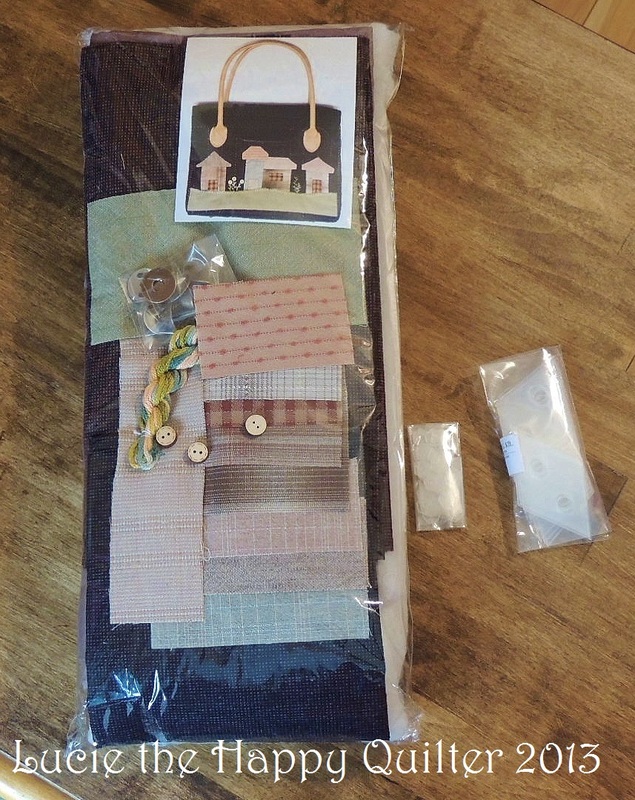 The kit comes with everything you need to make this quilt including beautiful wool felt and wooden shaped buttons for embellishing. From the same stand I bought some plastic templates for diamonds and ¼” hexagons. The best part is I got my very own personal tutorial on how to work on the hexagons. It was first thing on Friday morning before anyone else had arrived at the stand and the lovely lady showed me exactly how she deals with the whole process. 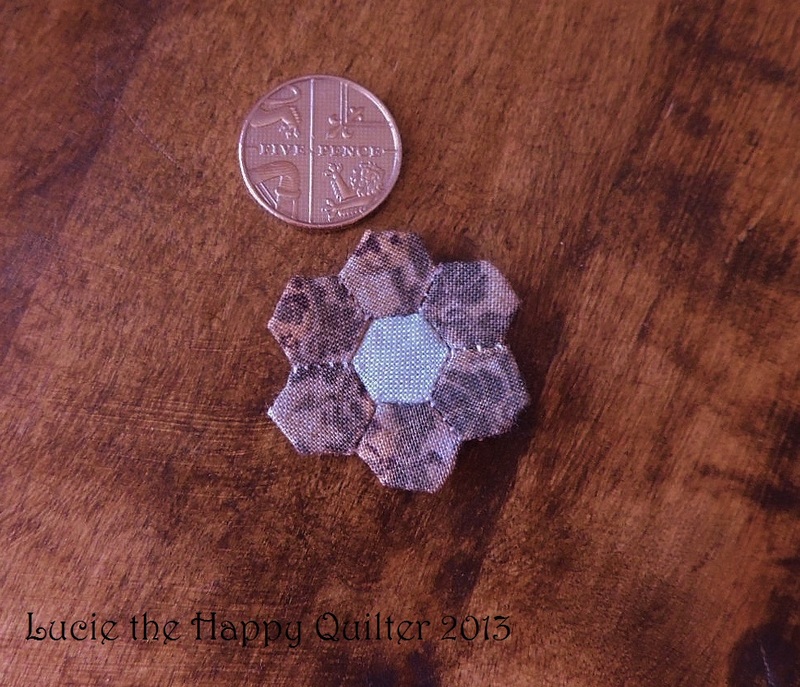 So I set to I made one hexagons flower just to prove to myself that I could do it too. And here is my sample. Please look past the contrasting thread I used. 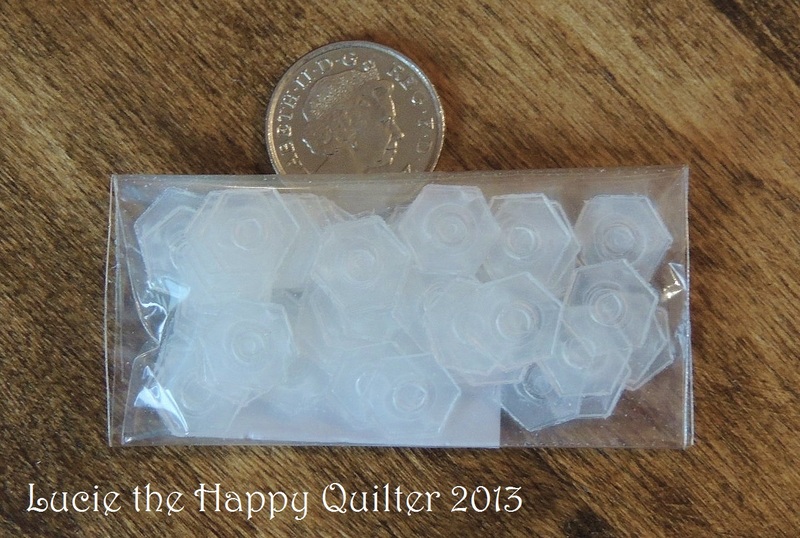 With a bit of practice and blending thread these little hexagon flowers will be beautiful. It just goes to prove that practice is your best friend. So that’s my report about my experience at The Festival of Quilts. The journey to and from was worth it. I thoroughly enjoyed myself. My hubby was ever so patient and carried all my bags so I could really have a good look around and soak up the atmosphere. And he has agreed that we should do it again in two years time. So I think it was a positive experience for him as well. My hubby is a great shopper. Well it’s been an interesting day. My Sarah and I stepped out to do a little box shopping. So now I have a couple of new boxes to keep a couple more of my projects. 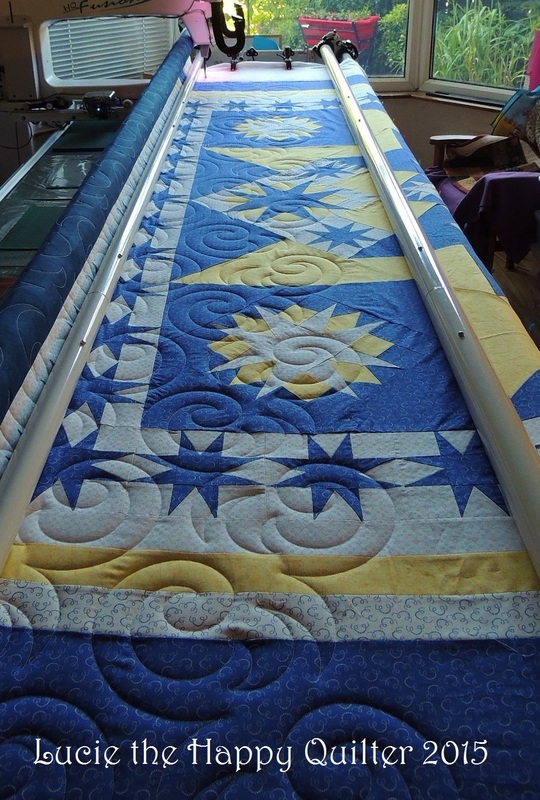 I loaded Helen’s wee quilt into my longarm quilting system which I hope to quilt tomorrow. I’m doing something a little different than what I had planned on Wednesday. I’ll tell you about that later in the week. So the quiet week that I was supposed to have is booking up quickly. My only quiet day and I suspect that will change is Friday. I spent some time doing some printing earlier this afternoon and I plan on cutting out some templates to go with the printing job later. There’s never a dull moment in happy longarm quilter land. Firstly I purchased this little assortment; a couple of rotary cutting rulers, thread nets, fine line air erasable and water soluble marking pens and an open thimble from Creative Grids. Does anyone out there use an open thimble? In fact does anyone out there use a thimble at all? Well I can’t sew without one. I can remember having a hard time working with a thimble 20 years ago…. how things have changed. 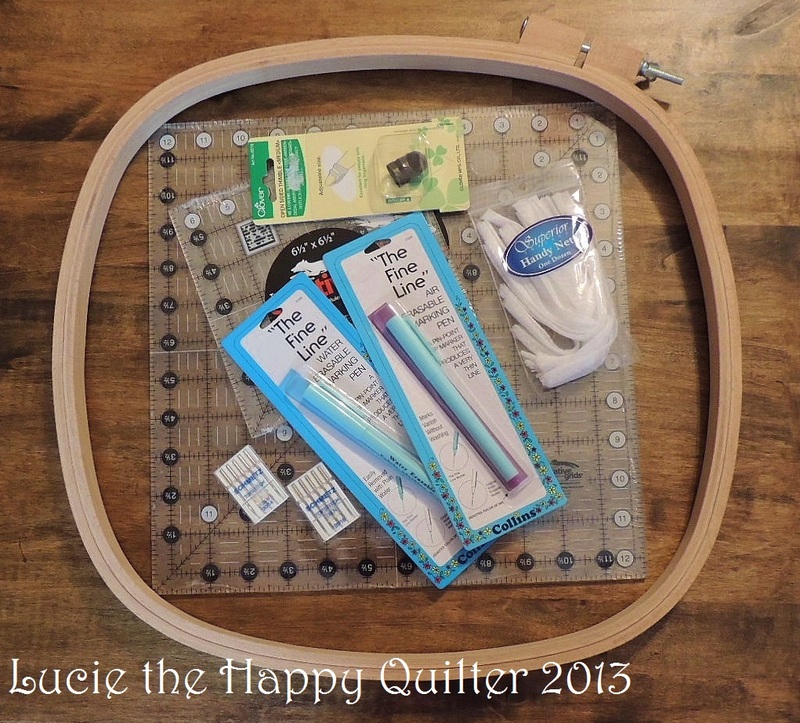 I also purchased some Top Stitch machine needles and a beautiful wooden square hoop with rounded corners from The Cotton Patch. Now this next lot is one of my favourites. 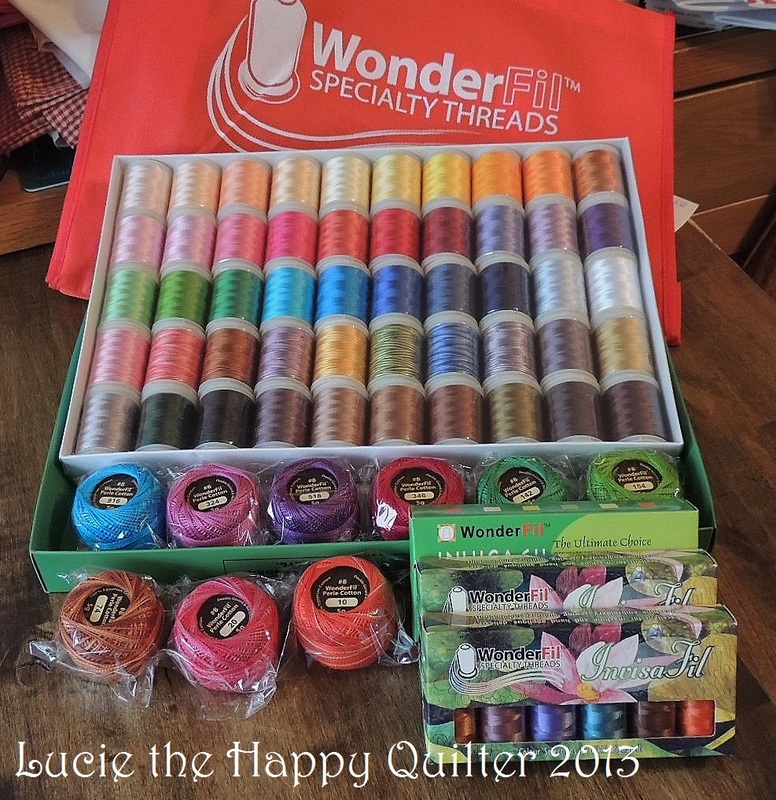 I visited the Wonderfil stand as I usually do whenever they’re at a craft show and I selected all of these threads……. I got a whole box of luscious rayon threads that I plan on playing with; the new Top Stitch needles will come in handy for stitching with these threads. I also bought some more Invisifil which is so fine it works beautifully for applique work. And last, I bought some Perl cotton for hand stitchery/embroidery work. I’m really looking forward to using my new thread. The colours are so vibrant that it will be a pleasure to play with these beauties. 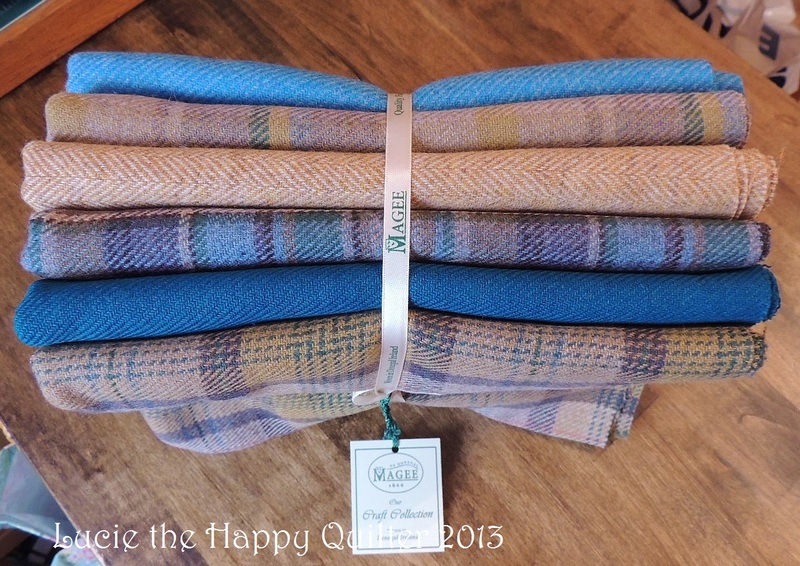 Now here’s your last lot for today…… From Magee of Donegal, I purchased this bundle of gorgeous woollens. I plan on using these for applique and such. I could have purchased the whole stand but I thought I would leave some goodies for others. So that’s it for today. I will post a few more bits tomorrow. Maybe ……. I’m really glad I went to the FOQ this year. I think I needed to see what’s going on all around me. And although I can’t honestly say that I saw anything that I had to come home and imitate exactly as I saw it, I did see several different techniques that I want to put together and tweak. I saw quite a few quilts made with solid fabrics in simple stripy type designs which I think I quite like the simplicity of. I also saw a little bit of Mixed Media which I will have a go at. I’ve done a little bit of Mixed Media on fabric and I really enjoyed it. So watch this space…… There comes a time when working with different techniques makes my day a little more interesting. I’ll show you what I make when I make it. So my Sarah and I have started settling into a new routine today. We stepped out to do a bit of sock shopping this morning. As strange as that might sound, we only have a few weeks left before Sarah goes to college. We will be stepping out tomorrow to do some box shopping to store my new projects. I love decorative boxes so why not purchase one or two to store my goodies/supplies for my new projects. If I find anything I like I’ll post about it tomorrow along with the rest of my purchases from the FOQ. I promised I would post a photo of the simple little skirt I made last week. So here it is Carol, as promised. Believe it or not I used lightweight linen and it looks really nice on. I like it so much that I plan on making another that I can wear this winter. I will be making the winter one a little longer so it covers the top of my boots. The skirt is cut on the bias and it hangs nicely when I’m wearing it. 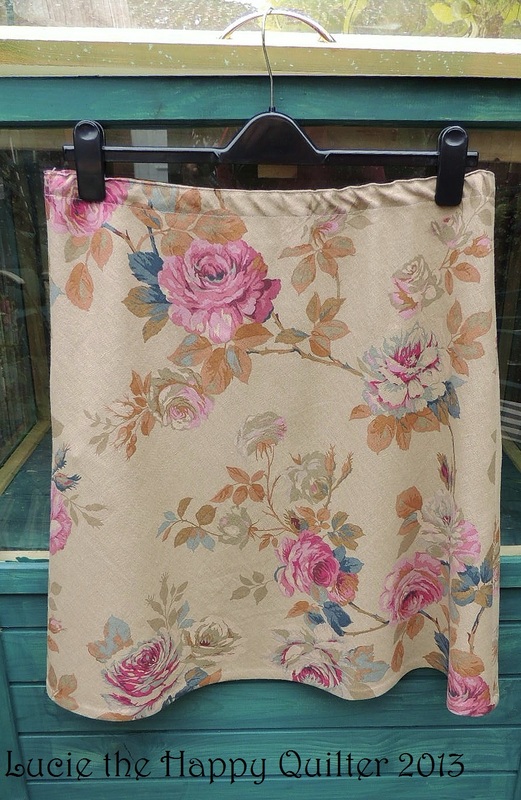 It’s a very long time since I did any dressmaking so this simple skirt was the perfect project. I have a quiet week planned. Although I do have quite a long To-Do List that needs blasting thru, I plan on enjoying the last of my down time. It’s been a great summer. I’ve enjoyed a few lazy sunny days but the temperature is much more comfortable now. We’re still experiencing plenty of sunshine. Everything always works better in the sunshine doesn’t it? Yes folks. We are back from The Festival of Quilts. It’s been a very busy 36 hours since we left for Birmingham yesterday morning. It was a four hour car journey from door to door yesterday. We didn’t do as well coming home because the roads were somewhat busier. I was hoping to bring you a big report this evening but to be honest I feel wiped out right now. So I will tell you that I spent my budget and more. For the most part I bought things that I cannot get in my LQS. What’s the point in buying things you can get at home. I really enjoyed my time at the show. And I’m really pleased with my purchases. So for the moment here is the very first purchase I made yesterday from The Contented Cat/Rio Designs stand. As far as I know I cannot purchase these needles anywhere near me and I have read that they are really nice to work with. So I treated myself. I’ll let you know what I think about them when I have used them. So that’s my report for this evening. After a good nights’ sleep I will sit down and compose a more in depth report and show you all the goodies I purchased. My goodness today has gone by quickly. It seems I just got out of my bed and it will soon be time to go back to bed! I’ve had a great day although it has flown by. I even did a bit of sewing today. 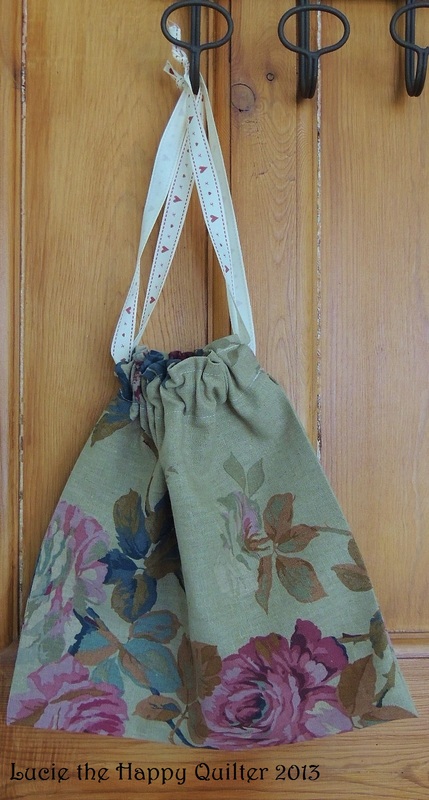 After running my errands I sat at the sewing machine and pieced a simple unlined drawstring bag. Do you recognise the fabric? Once I finished making that simple little bag I moved onto chain piecing a few more Arrowhead blocks. Do any of you chain piece? Well it’s quite a good way of approaching a large project but I find that it’s better if you just aim to chain piece a small batch at a time otherwise it takes a long time before you see any real progress. 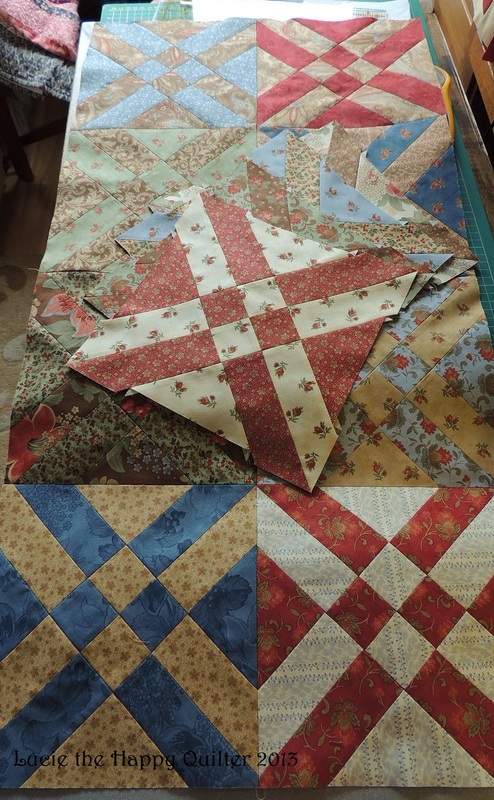 So today I was chain piecing four blocks at a time. 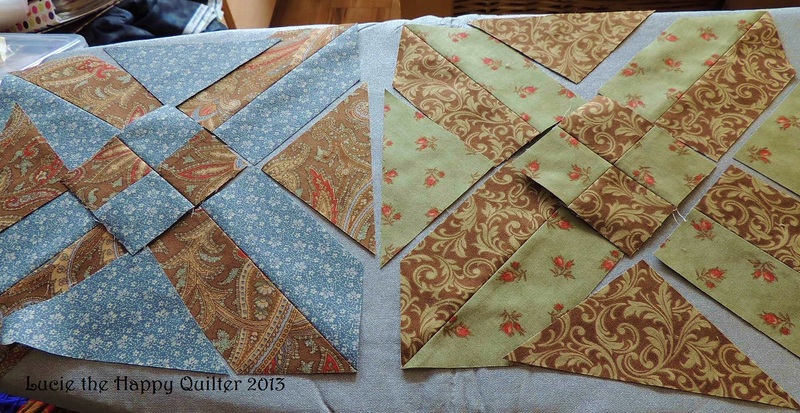 I didn’t take very long before I had the first four blocks pieced and joined together. So this afternoon I pieced a total of twelve blocks but I didn’t have enough time to join the last four blocks together. Anita’s Arrowhead block pattern recommends that you press the seams open. Well I’m not a great fan of pressing patchwork block seams open but I decided to do as I was told. I thought it would take that much longer to press the seams open but quite honestly it went very well. And this is how it looks on the back. I must admit that there are no bulky seams which will give me problems when it’s time to quilt. I quite like this block and it’s pretty easy to make. I used a Layer Cake which I cut down to 8” squares but I reckon we could use the full 10” squares to make these blocks. 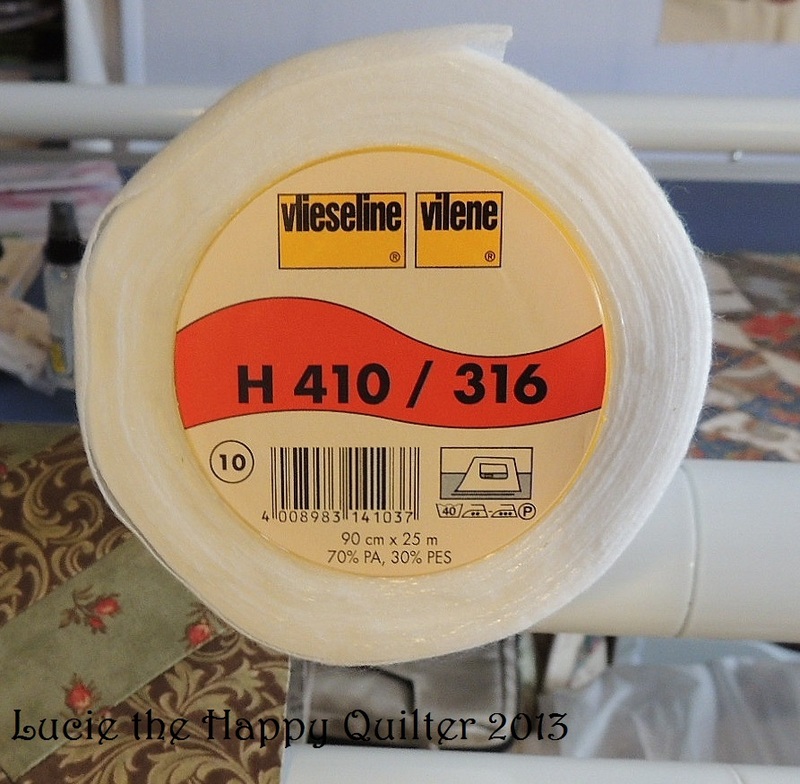 I was very excited to receive my roll of Vilene H410 this morning. The H410 is my new best friend. It’s great on the back of applique blocks to stabilise stitchery work. A few weeks back my lovely friend Anne said that her orchids were growing unexpected flowers. Anne put it down to the extra warm weather. Well it seems some of my orchids which have been dormant for quite some time have grown flower spikes and are in full bloom. Here’s an example. This one is my favourite colour. 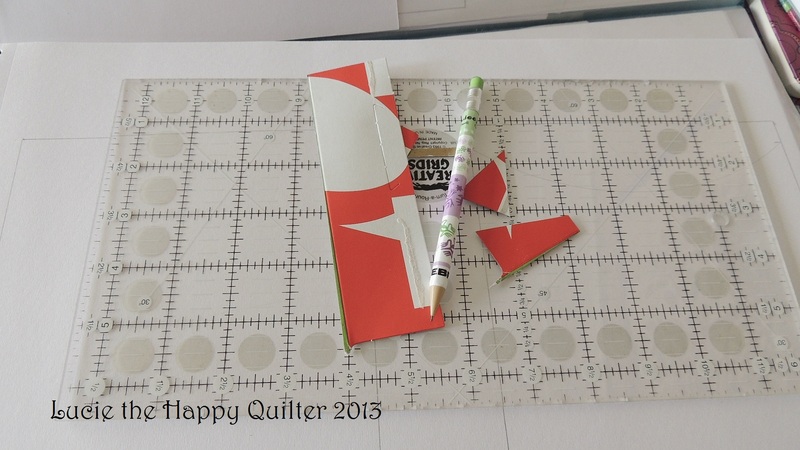 Well I’ve had a brilliant time in happy longarm quilter land today. 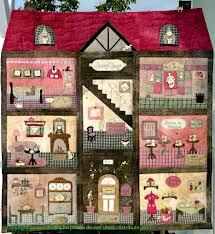 Two more sleeps and I get to go to The Festival of Quilts. Eeeeeeee…. I’m getting rather excited now. I have been wishing and hoping to go for the last few months. And at one point it didn’t seem possible but somehow it’s going to happen. I’m almost afraid to say it because I know anything can happen. I think I had better get my show guide out again and have another good read. I often get asked how I get so much done every day. Well I’m not sure I know the answer to that question. I think perhaps it’s sheer determination. I fill my days with as much as I can. However there are days when I wish I could just sit quietly and watch telly but I would feel guilty that I wasn’t getting anything done on that given day. Another reason I get loads done in one day is that I generally live a quiet kind of life. Quilt making and sewing related pursuits are a passion for me. And I love to design. So I don’t know if I have found the answer to the original big question but perhaps if you put all my statements together you can make sense about how I get so much done.